Esico International is regarded as the leading manufacturer, supplier and exporter of Moisture Titrators from India. Karl Fischer Moisture Titrator manufactured by the company is the finest quality volumetric titrator available. KF Moisture Titrator uses the latest micro-controller technology and advanced engineering techniques so as to give enhanced accuracy and reproducibility. 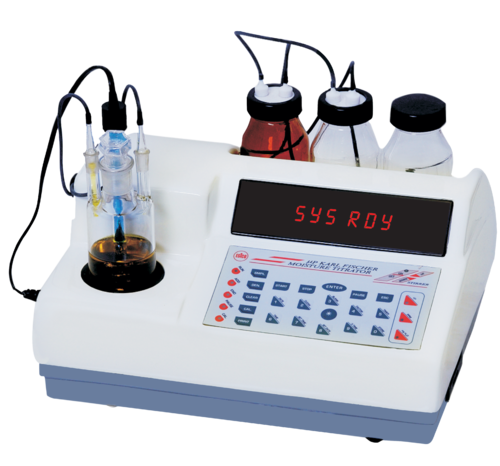 The microprocessor based system is easy to operate and has user friendly prompts which guide you throughout the titration process. The KF Moisture Titrator eliminates the use of conventional delicate and fragile glass burettes and plunger systems. It uses a highly sensitive motorized dispensing system for precise control of titrant volumes. It analyses the moisture concentration of liquid samples, powder, fine particles and fiber samples that are soluble in alcohol or solvents. Electronics India is also counted among the leading manufacturer and supplier of other instruments like Double Beam UV-VIS Spectrophotometer, UV-VIS Spectrophotometers, Visible Spectrophotometers, Fluorometer, Dissolution Apparatus, Disintegration Apparatus, Friability Apparatus, Melting Point Apparatus, Bulk Density Apparatus, Tap Density Apparatus, pH Meters, Conductivity Meters, TDS Meters, Dissolved Oxygen Meter, Turbidity Meters, Nephelometers etc. from India. Esico International established in 1993, India is a ISO 9001:2008 certified manufacturer, supplier and exporter of Analytical, Scientific Laboratory and Medical instruments. With a thriving product portfolio, Esico International manufactures General Laboratory, Pharmaceutical, Clinical and Field Instruments. The company aims at providing complete satisfaction to the clients by adding value through its gamut of products in scientific research and exploration. Our products are manufactured as per the international practice and norms. Consequently, we are one of the leading Scientific Instruments Manufacturers in the country. Besides, the company is also counted among the prime Laboratory Microscopes Suppliers in the industry. Esico International makes a wide range of Scientific, Analytical , Laboratory, Medical instruments including UV-VIS Spectrophotometer (Single Beam and Double Beam), Visible Spectrophotometer, Flame Photometer, Nephelometer, Turbidity Meter, Fluorometer, pH Meter, Conductivity Meter, TDS Meter, Salinity Meter, Potentiometer, Calorimeter, Hemoglobin Meter, DO Meter, Colony Counter, Titrators, KF Titrator, Water Testing Kit, Soil Testing Kit, Water and Soil Analysis Kit, Dissolution Apparatus, Disintegration Apparatus, Friability, Melting Point Apparatus, Microscopes and Telethermometer. Esico International has been serving some of the well renowned clients within and outside India. Electronics India is also exporting its products to large number of countries like England, Brazil, Syria, Iran, Nepal, Bangladesh, Nigeria etc. Our products are manufactured as per the international practice and norms under strict quality control. Consequently, we are one of the leading Scientific Instruments manufacturers in India.